I also did some more research on control linkages and whatnot. I may or may not invest in some nicer control horns and rods, but even if I use my el cheapo rods and zip ties again, I've got a much better understanding of how to position everything and do better bends on my rods for maximum effect. I plan to slightly enlarge my elevons as well, making it easier to link my short rods and giving more control surface. If I do all this right, my plane should not have any inherent control issues, and if I do it really nice, she should have excellent handling qualities. Well now that I almost have the good one done a 😡😡😡😡connector from my motor broke and I can't solder. Life just has this way of sabotaging me and not letting me have anything go right. Guess I'll order a second power pack and swap the motors for now till I can solder it or have somebody do it. Didn't need the second pack quite yet. Got somebody to fix the connector and got a soldering iron, should be able to do it myself next time. 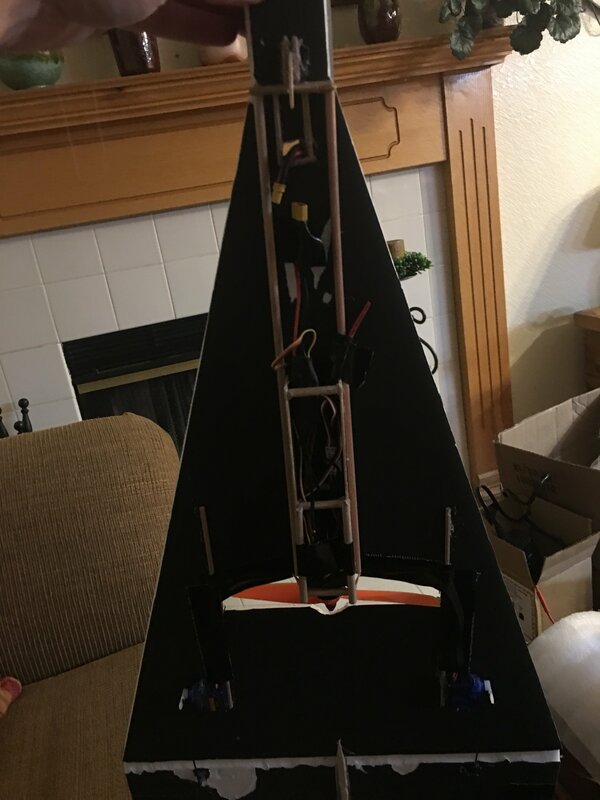 I have to cut and link the elevons and fabricate and attatch my vertical stabilizer, then it should be time to test, likely tomorrow. Without control linkages and vertical stabilizer, which won't add much weight, she's 213 grams, at almost identical dimensions to my last build which weighed 312, and the cg is far forward without adding extra weight. the difference in weight with the adams board is huge. Ready to test tomorrow unless extreme weather. I'm going to make sure I have absolutely no finger nails next time I work with this Adams board, because it's not particularly scratch and dent resistant. 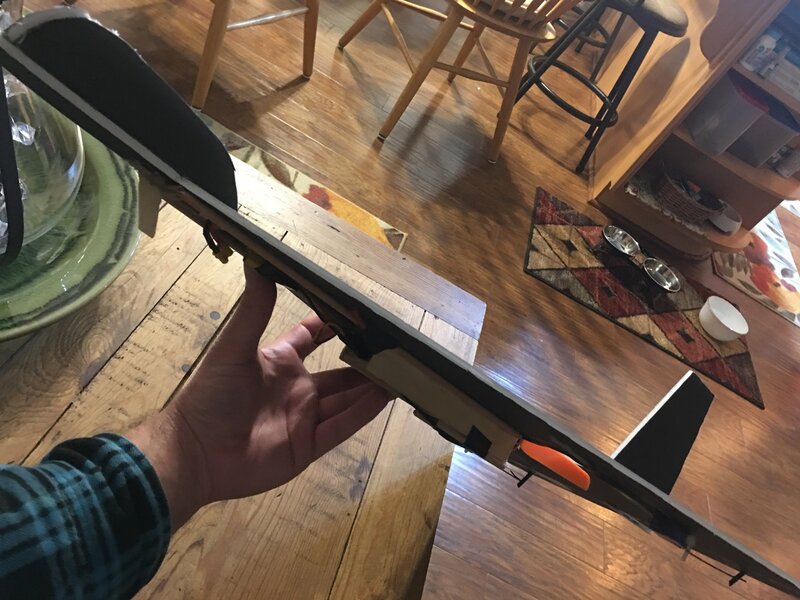 Most regular types of undercarriage or low mounted fuselage would get shredded pretty quick here in the desert on an imperfect landing,so I used some light wooden planks and dowels to make the skid cage that protects and organizes my electronics, and added a small skid on the nose. The nose I made simple and curved and somewhat bulbous like a predator UAV. It's sturdy and keeps my cg far forward, and it's a big step up from that weak, draggy, overengineered nose I had on the last rig. Fully loaded weight is a trim 226 grams, and cg feels just right now. Another turd. I really don't know why. When it broke, I made an even better more aerodynamic fuselage than either of my previous ones, then tried again. This one was actually a little worse than the elmers one. It had basically the same problems-caught a bit of lift but could not gain altitude. I don't know if something is broken or underperforming, if it was weight again which I doubt. I played with the cg a bit but no real result. I think I'm going to take a break from the foamboard for a bit, at least until I get my Trojan and fly it properly. I don't know what it will really teach me about building, but at least it will teach me the flying part and provide a fun distraction. I'm getting pretty good with quads, but I really want to at least get into fixed wing with something. The problem with modelling such a drastic sweep angle on a small model is that the air molecules travel from high pressure areas to low pressures extremely fast as the distances are quite small. With tiny wings this means that the air along the wing leading edge is rapidly turned towards the fuselage and the low pressure area, (required for lift) is swamped UNLESS the speed is quite high, I estimate 50+ MPH! You could make lift gains it you installed turbulence generators along the entire wing LE but the drag will of course increase. The generators will provide vortices to resist the sideways flow of air over the slender wing to some degree and help maintain proper boundary layer flow which is essential for lift to be generated! If you took the same wing planform and scaled it up you would find that you would reach a point where the lift would be generated at a sufficiently slow speed but the size might be quite large. The other alternative is to do a MASSIVE weight reduction down to the sort of weight a paper plane would have. Sadly with small models the Reynolds numbers are a true problem. Just my thoughts of course! I could scale the build up a decent amount, but just how large I could even build around the A pack, I have no idea. I could buy a power pack for larger planes, but it's hard to justify spending much more money on this now. I don't know how effective it would be to add the turbulence generators to the smaller airframe. I have no experience using them, I just know that that's what the wing form itself is supposed to be with this build, one big vortex generator. If the wing itself isn't doing what it's supposed to at that size,adding those seems a bit like putting roses on a turd pile or taping model rocket engines to a broken space shuttle. There are no kits, no plans, no anything for this type of plane. If freewing made a 64mm edf Hp-115, I would have bought it by now. If there were plans, I would be trying to go off those. Nobody wants to build it for me, so I'm on my own completely. All I'm learning from this is that hard work and perseverance don't seem to pay, because there's always some new stumbling block that rears its ugly head when I think I'm making progress. You can either do it or you can't, and I'm starting to think I can't. almost just isn't good enough when it comes to flight. If I have to build this thing 4 feet long and near two wide, I will. I just need a real game plan to approach this again. I need to know if I can even approach this build with my a pack at all, or if I'm going to need a different power pack. I need to know how large I'm going to have to scale this up to get ideal performance. Can I get away with a 3 footer, or do I have have to build around one of the "large fixed wing" packs? Another thing that will be important is the type of fuselage I will want, and how I will access and lay out the electronics. I know nothing about building with airfoils. Will this build require an air foil of some kind at larger sizes? I have seen all of those. It's a gorgeous model. That depron EDF build with all the ribs and planks is extremely precise and meticulous. That is far beyond my skill level. I need a dumbed down foam board build. That depron build is the type of thing I'd have to pay somebody else to build for me, but then have no idea how to repair or rebuild. I'm trying to make this out of foamboard with a pusher prop, in as simple a configuration as possible. Even if that depron business is way beyond my skill level, I still appreciate you poking around to find plans and whatnot. I'm taking your suggestion of air flow control augmentation with various devices along the wing seriously. I will likely buy a more specialized motor and stuff for this build and maybe try something simpler with my A pack in the mean time, like a flyer or a wider more basic delta. I also got the little hobby zone Trojan coming in soon to learn on. Hopefully it is good to go out of the box. It seems to be a far better product than the last thing I bought to train fixed wing on. Just so that you are aware FB is far stronger than depron especially as a covering and therefore the internal ribs are not all required. You could do the wing covering pieces and then experiment as to how few formers you would require to maintain wing shape. The fuselage could be "Squared" up and possibly made without any formers at all. Not a bad idea at all, but I don't really want to create ribs on the wings or do an airfoil at all if I don't have to. 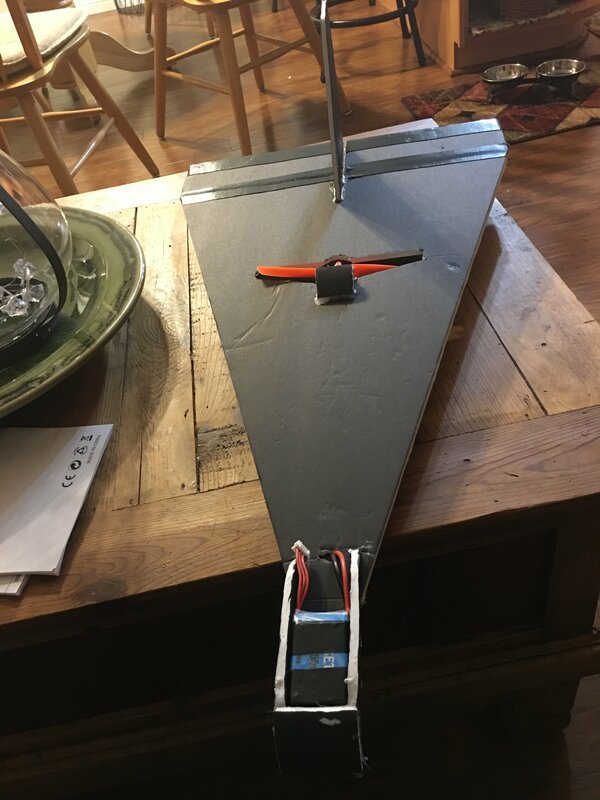 Dr. looping Louie's build didn't require one, many ft builds for various planes require no airfoil and it is beyond my current skill level to make an airfoil. Part of why I want a more specialized motor and whatnot for this, I just want this to work with as simple a build as possible. Also, with an edf the straight up hp-115 shape can work. With a pusher I feel I have to get custom because that fake engine on the tail is just more weight and drag if it has no edf in it. The hp-115 is built a certain way, and it's wing can translate to a pusher but the rest is set up for an edf or reaction jet engine.